How Do I Put An iPad In DFU Mode? Here's The Fix! 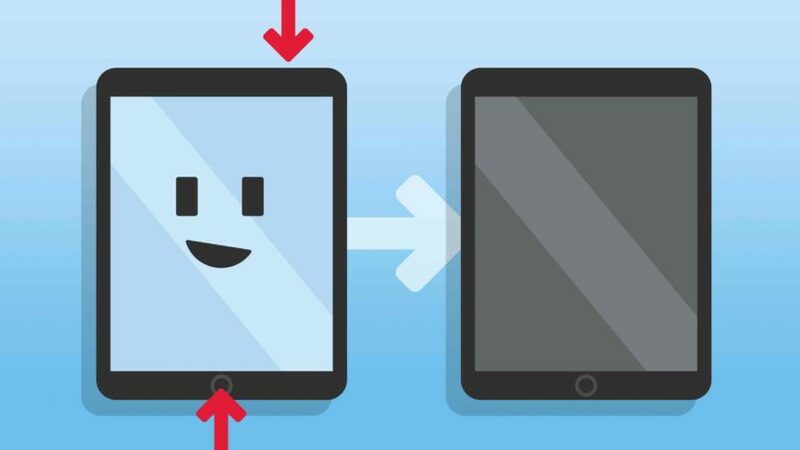 You are at:Home»iPad»How Do I Put An iPad In DFU Mode? Here’s The Fix! Your iPad is experiencing software problems and you don’t know what to do. A DFU restore is a great way to fix nagging software issues that keep occurring on your iPad. In this article, I’ll show you how to put your iPad in DFU mode and how to DFU restore your iPad! What Is A DFU Restore? A Device Firmware Update (DFU) restore is the most in-depth iPad restore. Every single line of code on your iPad gets erased and reloaded when you put it in DFU mode and restore. The DFU restore is usually the last step you can take before completely ruling out an iPad software problem. If you put your iPad in DFU mode to resolve an issue, but that issue persists after the restore is complete, it’s likely your iPad has a hardware problem. A computer with iTunes installed on it — but it doesn’t have to be your computer! We’re just using iTunes as a tool to put your iPad into DFU mode. My iPad Has Water Damage. Should I Still Put It In DFU Mode? Water damage is insidious and can cause all sorts of problems with your iPad. If your iPad issues are the result of water damage, you may not want to put it in DFU mode. Water damage could potentially interrupt the DFU restore process, which could leave you with a completely broken iPad. It may be a good idea to take your iPad into your local Apple Store first if you think its problems are being caused by water damage. What Should I Do Before Putting My iPad In DFU Mode? It’s important to save a backup of all the information and data on your iPad before putting in DFU mode. 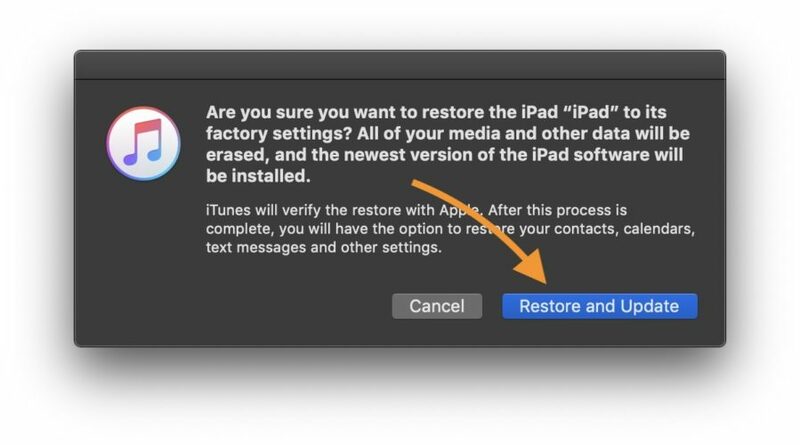 A DFU restore erases all the content on your iPad, so if you don’t have a saved backup, all of your photos, videos, and other files will be erased for good. Follow the steps below to learn how to put your iPad in DFU mode. If you’re more of a visual learner, you can watch our step-by-step iPad DFU restore video on YouTube! Use a Lightning cable to plug your iPad into a computer with iTunes. Open iTunes and make sure your iPad is connected. Simultaneously press and hold the power button and the Home button until the screen turns black. Three seconds after the screen turns black, release the power button, but keep holding the Home button. Keep holding the Home button until your iPad shows up in iTunes. If your iPad didn’t show up in iTunes or the screen isn’t completely black, it isn’t in DFU mode. Fortunately, you can try again by starting at step 1 above! Now that you’ve put your iPad into DFU mode, there are a few things we need to do in iTunes in order to begin the DFU restore process. First, click “OK” to close the “iTunes has detected an iPad in recovery mode” pop-up, and then click “Restore iPad…“. Last, click “Restore and Update” to consent to everything on your iPad being erased. iTunes will automatically download the newest version of iOS to put onto your iPad. The restore process will start automatically as soon as the download finishes. Restored And Ready To Go! You’ve restored your iPad and it’s working as good as ever. Make sure to share this article on social media to show your family and friends how to put their iPad in DFU mode too! Feel free to leave any other questions you have about your iPad in the comments section below. 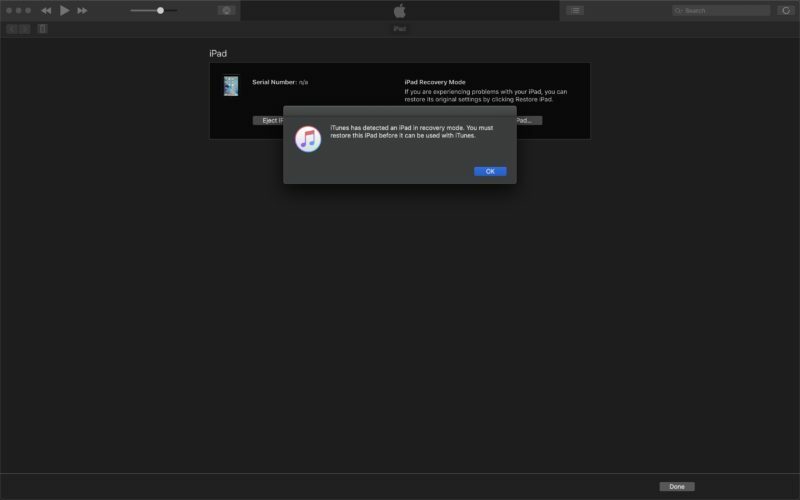 Previous ArticleMy iPad Is Disabled & Says “Connect To iTunes”! Here’s Why & The Fix. Next Article Why Does My iPad Ring? Here’s The Fix For iPad And Mac!